When a VAT return period has been marked as filed, if you edit any transactions within the filed period, or enter any new transactions dated during that period, FreeAgent will automatically move any VAT effects to your next unfiled return. It's important that you do mark your VAT returns as filed as you go along, so that you have an accurate record of your returns to show to your accountant and/or a visiting HMRC & Customs inspector. Marking a VAT return as filed also automatically marks as filed any older, unfiled returns. Can I set a return back to "Not Filed"? If you select the Filed button (which replaces Unfiled once the return is filed), FreeAgent will do this for you, but it will also mark as unfiled any future filed returns. So if you've marked both your March and June VAT returns as filed, then you mark March's as unfiled again, FreeAgent will also mark June's as unfiled. HMRC expect that, if you make a mistake on a VAT return, you'll correct it on a future return, not by changing an old return. So it's not usually a good idea to start marking historic VAT returns as unfiled. It's safe to mark the latest return as unfiled if you discover before you've filled in your green form that you've left transactions off, but otherwise, correct VAT returns in the future, not the past. You can also make corrections to a historic VAT return without marking it as unfiled. 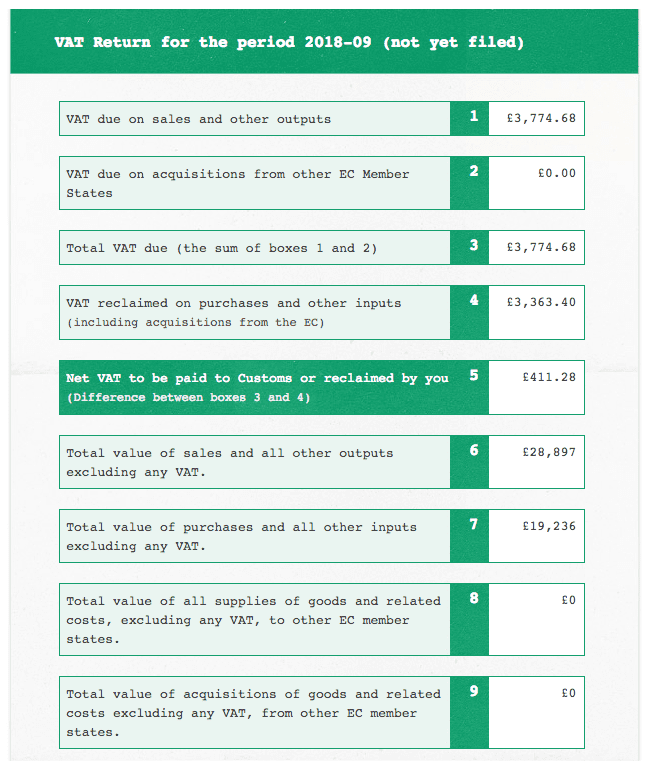 Once you've marked your VAT return as filed, you can write the figures here on to your green form, or type them into the HMRC online filing website. Or you can file your VAT return online directly through FreeAgent.